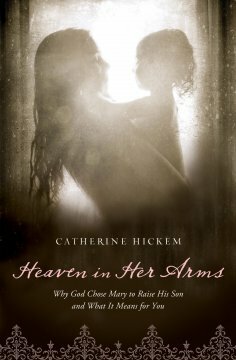 I have to admit when I first saw the title of Catherine Hickem’s book, Heaven in Her Arms- Why God Chose Mary to Raise His Son and What It Means For You, my interest was peaked. I have always been drawn to the faith of this unassuming, young woman of the Bible who has through various denominations been deified, defended, glorified, minimized, scrutinized and idolized. As for me, I knew if there is one lady in scripture who could teach me something, it is Mary. Mary, the Maidservant of The Lord. Mary, the humble Jewish girl. Mary, the wife of Joseph. Mary, the tender, submissive, faithful mother to Jesus. Mary, a woman who both inspires, intimidates and baffles. Indeed, I had no problem being drawn to this book, like a moth to flame. But here is the clincher. I have ever read on motherhood. together to birth wisdom, truth and inspiration for Moms. She peels back the skin and helps us connect to the real life lessons and invaluable truths that unfold in scripture in the life of our heroine. She empowers us in our calling and equips us with wisdom that is translatable to our unique circumstances. Catherine’s book is full of quotable quotes and I found myself carried along into the life of Mary, in the stable, in the synagogue, at the Wedding of Cana and at the side of Jesus throughout His life and ministry. So often we look at the life of the disciples. The twelve. Yet there is much to learn from this young girl, chosen by God. So often she is either made holier than intended or dismissed due to a variety of misunderstandings and misguided perceptions. Mary is no more than the Mother of God, but she is also no less. As Catherine states in the Prologue-she is worthy of our attention. I believe you will gain a deeper appreciation and understanding of Mary through this well written book. I especially want to invite moms to check this fine book out. Catherine excels at speaking to the hearts of moms who have children who have unique challenges as well as those who want a closer connection to God with regard to their role as a mother. Great review! Sounds very intriguing, makes me want to check this book out. Thanks Dawn! Susie, thanks. I really devoured it- once I opened it up…in Maine! I attended an Intentional Moms conference with Catherine. She is awesome!